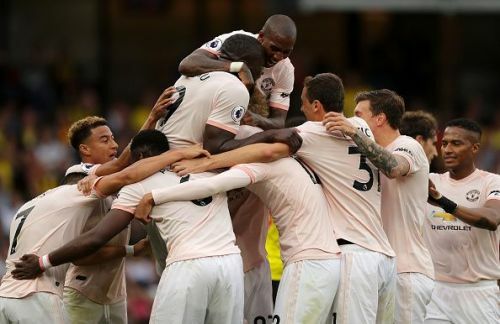 Manchester United faced Watford on Saturday under unusual circumstances. United had suffered 2 losses already after just 4 games. Watford, on the other hand, had won all of their 4 games so far. The Hornets won their last game at home against Tottenham, while United were themselves coming off a 2-0 victory over Burnley last weekend. United needed a win to get their season back on track and knew it was not going to be easy. History suggested that United were the dominant side in the encounter, with 20 wins and 5 draws out of the 30 games these two sides have played against each other. United won 4-2 last season at the Vicarage Road and also won the home game 1-0. Mourinho started with De Gea in goal and Valencia, Smalling, Lindelof and Young in defence. In the midfield, he opted for Matic and Fellaini to partner Pogba. Up ahead, Sanchez, Lukaku and Lingard started together for the second successive game. Mike Dean officiated the game. United started the day strong, with some brave goalkeeping from Foster keeping Lukaku from scoring early. There was intent in United's game, they were not too respectful of Watford for what they had achieved and pressed them hard in their own half. Watford, in return, defended deep and relied on a fast counter-attack to catch United off-guard. However, United's efforts bore fruit when Lukaku put them ahead in the 35th minute. 3 minutes later, Smalling had doubled the lead and United were cruising. The game went into halftime with the score at 2-0. Watford came out faster in the second half and after United wasted a few chances to seal the game, got a goal back through Gray in the 65th minute. From then onwards, the Hornets pressed and United held on. The Red Devils could have sealed the game on the counter on a couple of times, but poor finishing let them down. Nemanja Matic saw a red card in the 93rd minute to pile on further pressure on United, but they held on, thanks to De Gea and secured a win that put them in 8th on the table. United finished the game with 58% possession and attempted 520 passes with 80% accuracy. They attempted 9 shots, 6 of which were on target. While the team worked together tirelessly to gather the vital 3 points, there were 5 players who were vital in this win and we take a look at them here. The one name on the team list that usually ruins the day for United fans, Fellaini is the player whose involvement with United is still questioned 5 years since his joining, yet one cannot disagree that the Belgian can be effective in his own special way. Against Watford, Mourinho opted for Fellaini’s steel in midfield, just like he did against Burnley last weekend. Mourinho is known to favour the Belgian, but the manager’s use of Fellaini has been different this season. The Belgian is still a target man during set pieces, but Mourinho has been deploying him in an entirely different deeper role for two games now and it has been effective so far. The Portuguese has shifted Matic slightly higher in the field and has opted for Fellaini in the Matic role. This has worked well in two ways so far – Fellaini’s woody clumsiness no longer affects United’s fluid attacking football and his big frame contributes to defensive stability. Against Watford, the Belgian regularly slid in between the two centre-backs and allowed the fullbacks to operate at a higher position. It also allowed Matic to play a slightly attacking role, where his assured passing and interceptions were an added bonus. 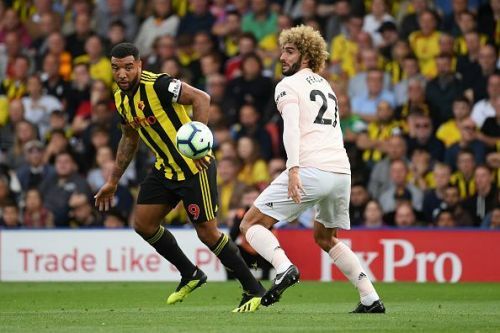 Fellaini was not entirely convincing in the role and looks like a temporary option until Fred gets his act right, but it was enough to see off a stubborn Watford side. The Belgian’s presence was crucial for each goal and he also picked up an assist when his header was turned into the net by Smalling.